We are currently not aware of any outstanding problems. 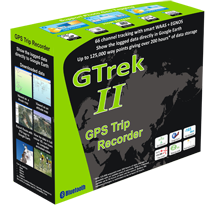 Run the GTrek application of your choice, connect your GTrek and switch it to the LOG position. Click "Save", this action will reset your GTrek, reset the default parameters and clear the memory. "Arithmetic operation resulted in an overflow". or "... records were ignored ..."
Answer - These erros are due to data in the transmission stream being lost. The current version of the software should fix this error. If the problem persists close any other programs that may be running or re-boot your PC and try again with a clean system.